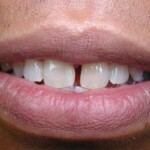 Many of us have gaps between the teeth. This may be a concern in the front teeth particularly. Many of us may recall when a magazine closed the midline gap in a photo of Madonna. Madonna was publically upset about that; she wanted the gap to remain. While some of us like Madonna may have no issue with gaps between the teeth, other people do have concerns about the gaps. The gaps may simply be cosmetically displeasing to them or the gaps may gather food as they eat. In any case some want these gaps to be closed. They want to feel more confident and more attractive. For some patients a correction like this can free them to express their personality more comfortably. To close these gaps several options may be chosen. 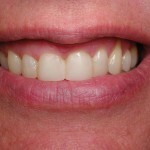 At times a porcelain veneer or laminate may be recommended to close the gaps. At other times bonding, or a white filling material, may be recommended to do the same. 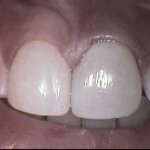 The decision of whether to use porcelain or bonding is based on several factors. These factors include how much patients want to invest, whether patients want to change the color of their teeth, how many of the teeth will be enhanced, and the lengths of the teeth, among other things. 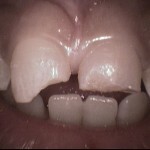 In this case the patient wanted us to add back the bonding material to the right side tooth in order to close the gap. After about 45 minutes the procedure was complete. 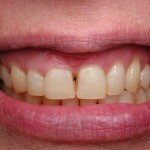 However, this patient decided that re-bonding the other front tooth would create a better result. We agree with her. By replacing the other tooth’s bonding we can enhance the shape of that tooth and we can make a more equal width of the two front teeth. That would greatly enhance the result. But even with caring for the one tooth, this patient left the office very pleased. If we can assist you or a family member, a friend, or a coworker, we invite you to contact us. Thank you for your interest in our site and in bonding! White fillings have been around since the 1980′s. They are now considered a very nice alternative to the classical silver fillings. 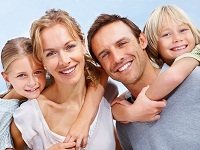 The advantage of white fillings is their ability to seal and bond to the tooth structure. 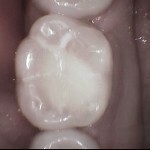 As a result of this seal or bond, these white fillings can be more resistant to recurrent decay. A second advantage of white fillings is that they are more insulative than silver fillings. As a result of this property, white fillings can be less sensitive to cold air, fluids, and foods. An obvious third advantage of white fillings is that they appear much more natural. However, white fillings come with some disadvantages. Although there are many advantages to white fillings, there is a down side to these. 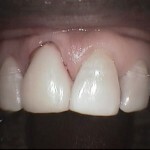 Firstly, the placement of white fillings is much more demanding technically. The dentist placing these must be diligent and attentive to provide for the best bond of the white filling to the tooth structure. Secondly, if there is a deficiency in the technique and procedure of the dentist, these white fillings can be extremely sensitive and painful. Thirdly, the dentist controls the white material and bonding agents to be used. The quality of the materials chosen does vary. Some materials may not bond as well to tooth structure and other materials may be weaker and wear at a greater rate.My patients rarely encounter the down side of white fillings. We carefully select our materials for the benefit of our patients. We are also very meticulous with our technique and attentiveness. So a white filling purchase is not the same from one office to another; it is not like buying a Polo shirt from Neiman’s or from Marshall’s, which is the same shirt. No, the dentist creates a large variable in the success of these white fillings. If you are interested in sharing the experiences of our existing patientswe invite you to contact us by calling (12345678910, or by any other way you desire which is available on this web page. Smile Makeovers can be done in many ways. 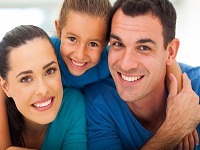 Smile Makeovers needn’t be the cost of an annual private college tuition. There are options. In my practice we are very willing to discuss the goals of a smile makeover with our valued patients. In my practice the patient drives the entire discussion. Never do we pressure patients to obtain this makeover; never do we present only the most expensive option. We simply respect patients too much. This patient was looking to enhance his smile. He was not looking to get into something very involved. He wanted a more attractive smile. 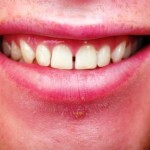 All his life he had gaps between his teeth. He was looking to close these gaps. We introduced the option of bonding. With bonding, we were able to dramatically enhance his smile. We were able to accomplish this without getting him numb. 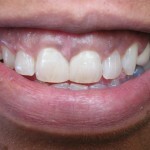 We were able to accomplish this within two hours with a minimal loss of natural tooth structure. This patient left very very pleased with his new smile. If you are interested in a practice that respects their patients, that allows patients to be involved in their treatment decisions, that does not pressure patients into obtaining extensive treatment that is inconsistent with their desires, that truly cares about its valued patients, that is interested in saving patients their hard-earned money over the long-term, we invite you to contact my office. We would value your presence! Today we had the opportunity to really help one of our valued patients. This patient came into our office with most of the front tooth broken away. Many years ago this tooth had been treated with a root canal procedure. However, the tooth never received a crown. Root canal procedures require the removal of tooth structure and they cause teeth to dry out. 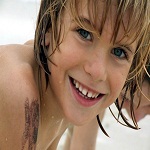 As a result, particularly for the back teeth, crowns are recommended for strength. But in this case a crown was not provided and I would say I agree with that. After many years the tooth weakened and broke. Naturally this patient needed a quick fix in order to provide a nice appearance and to restore the patient’s confidence. I would not at all feel comfortable going to work with a broken out front tooth! Within 90 minutes we were able to place a post within the root canal filling and build a new tooth from our composite (plastic) resin filling material. The patient left very pleased. 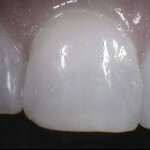 While the result was quite natural looking, we do recommend that this patient return for crown preparation and delivery. That option would provide a stronger result. Today this patient was not willing to initiate a crown procedure so we were able to provide the next best option. This option saves the patient some money at this time. However, we do still recommend that a crown be done as soon as the patient is comfortable pursuing it. If you or someone you know would value our emergency service and our expertise with cosmetic dental procedures, please do contact us at (1234567). There are multiple ways to repair broken teeth. 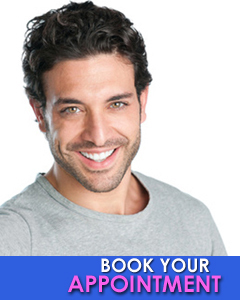 The options include dental bonding, porcelain veneers, or crowns. In this example we will discuss dental bonding. Dental bonding is a conservative way to repair teeth, it is easily repairable, it is the preferred option for children, and it is less expensive than porcelain veneers and crowns. 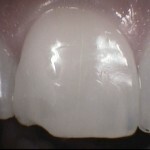 The results with dental bonding can be just as dramatic as other options. With dental bonding the expertise of the dentist is most at play because it is the dentist who is creating the teeth. With the other options a dental laboratory fabricates the teeth through the expertise of dental laboratory technicians. 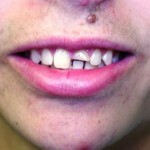 In this case a teenager had a front tooth that had been broken years ago. 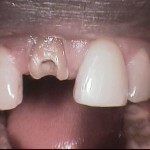 It was originally repaired by bonding the tooth segment back into place. While this option is not done as often, it did provide for many years of service. However, this option did eventually fail by falling out once again. The next time a dentist provided dental bonding. However, the repair only lasted for about 18 months. It was at this time the patient came to our office after being referred by a satisfied patient of ours. After presenting the options for care the patient and mother decided to again try dental bonding. The photographs show the before and after of this case immediately upon completion of the repair. This care was provided just yesterday. Over the next several days the adjacent teeth will resaturate and will darken to their original color; we know the result will look even better. Procedures like this are extremely rewarding. This can be accomplished within 90 minutes and the results are quite dramatic. If we an assist anyone with this procedure we invite you to contact us at (1234656789). Bonding is a way in which dentists can replace tooth structure in a single visit with a tooth-colored filling material. Bonding can be used to close gaps between teeth, to replace broken corners from teeth, or to change the color and/or shape of existing teeth. 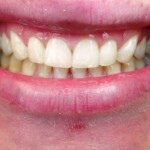 Typically, veneers refer to a porcelain restoration which usually takes two visits to provide. 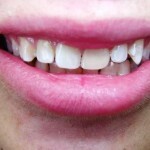 Veneers are considered stronger and more color stable. They also are more resistant to wearing away. Veneers are considered more durable than bonding. Bonding materials are usually made of a specially formulated plastic material. These are considered easier to repair if a portion breaks away. 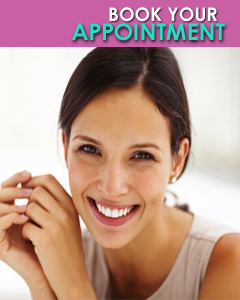 Since they can be done in a single appointment results can be obtained quicker. 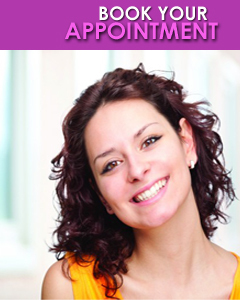 We like to visit with patients about their desires prior to appointing for a bonding procedure. This enables us to learn their desires so we can make sure that bonding is indeed what they want. This also enables us to present other possible options so our patients can make informed decisions on their care. We simply ask that patients give us a call so we can schedule a time for a consultation. How Long Does a Bonding Procedure Last? Most bonding procedure can last from 5-12 years. However, this can vary depending upon the habits of the patient, and the patient’s compliance with caring for the bonding procedures.